“Oh my gosh! Is that the Himalayas out there? Yeah that’s the Himalayas. 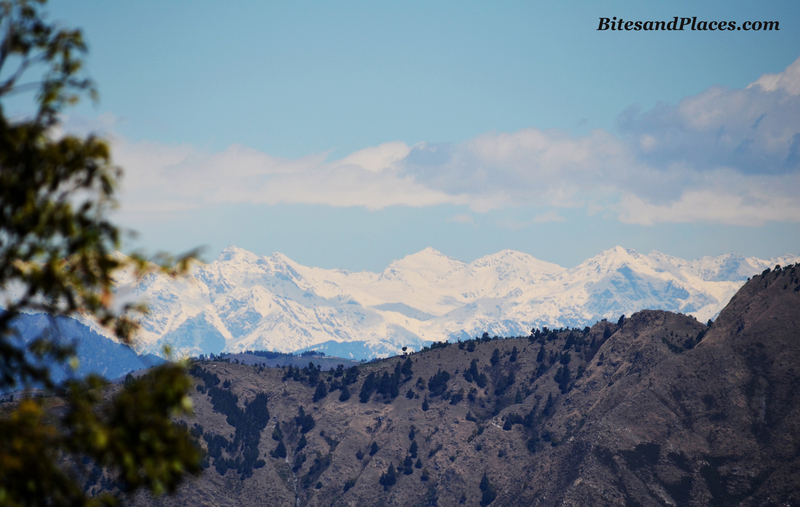 Yaayyyyy we can see the Himalayas from our windoooowwww!”…I shrieked and leapt as I opened our window to let the morning sun inside our freezing room. Tullahmore Estate is a century old colonial bungalow. The earlier version of it belonged to the British and has now been renovated to its grandeur. 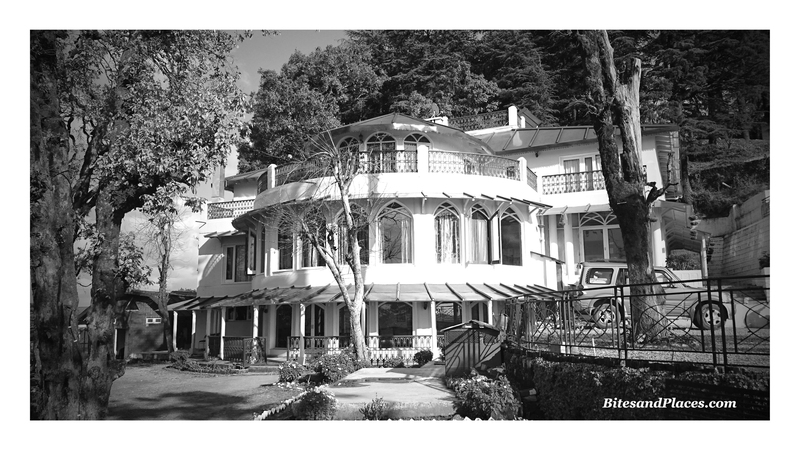 Photographs of its Brit avatar along with its renovated counterpart adorn the walls of the reception. 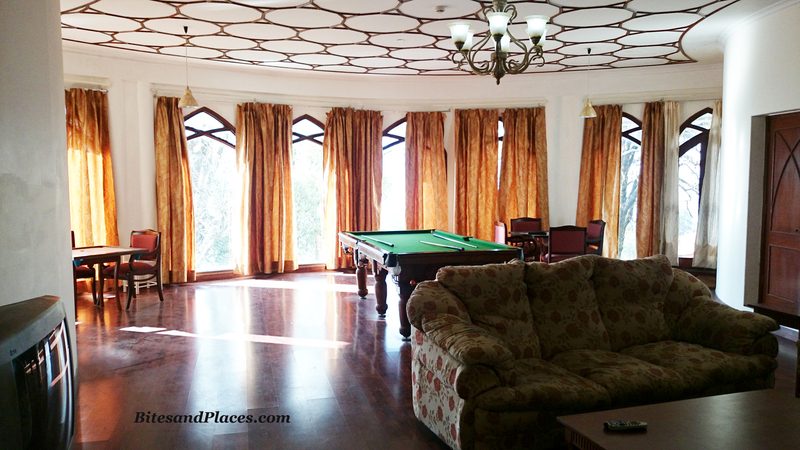 Tullahmore is located on a mound, offering pristine views of the Himalayan range and alluring scenic locales. The weather here caught us totally off-guard. 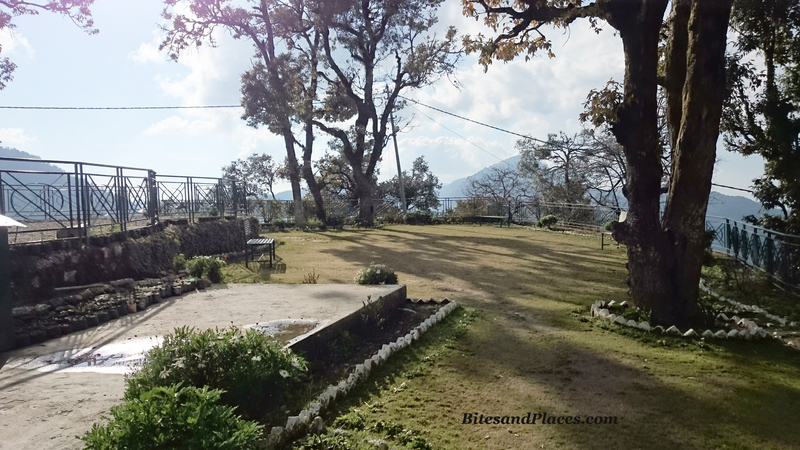 Being the second week of March, we’d packed just the light woolens… while Mussoorie was freezing with temperatures dipping down to 8 degrees. Accommodation – Tullahmore Estate is a B&B property with 10 eco-friendly rooms doting the bungalow. We stayed in the Hill View room. Pale warm colors, vintage lamps, wooden furniture, flooring and high shingled roof, all blend well with the beautiful scenic outdoors. 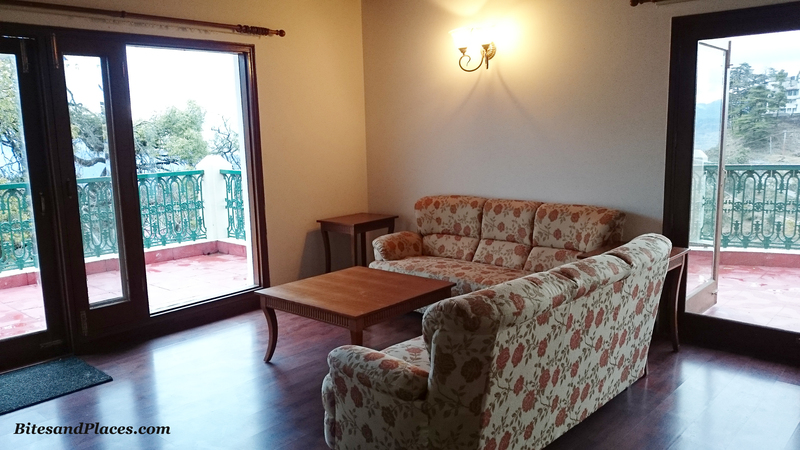 The main door opens to a spacious bright living room. This in turn opens to two balconies offering the most blissful views there can ever be. 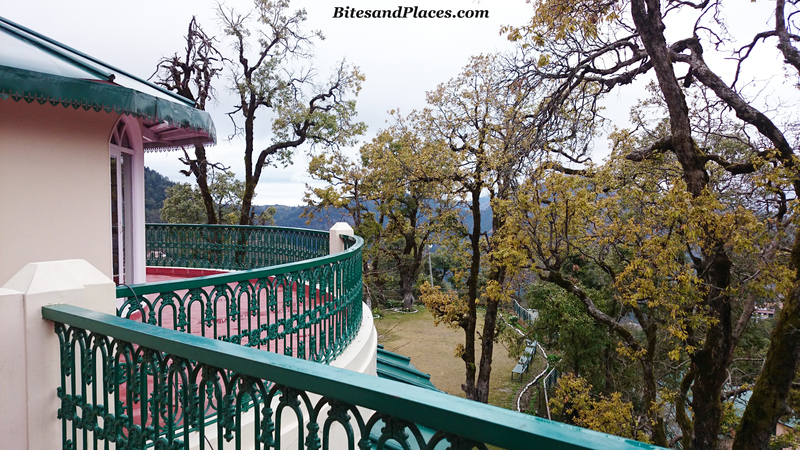 Imagine sipping a cuppa while the mountain winds start to nip and nudge you. 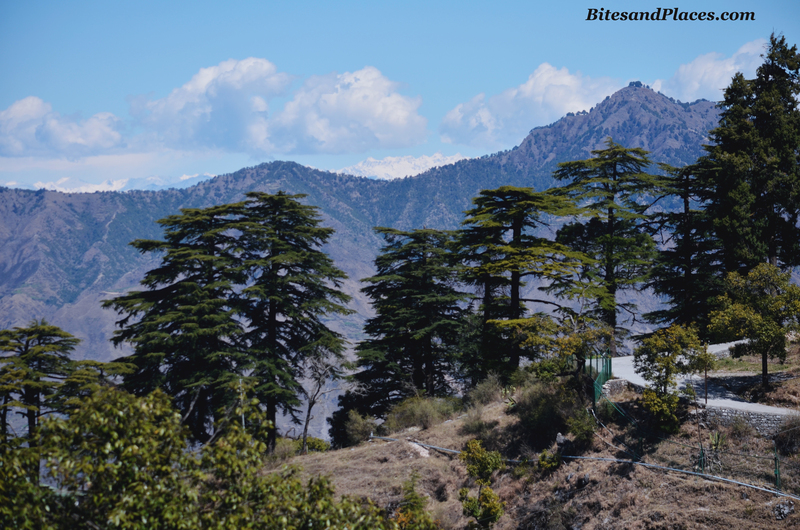 Or doing the morning yoga in those serene environs while the towering Deodar trees coyly watch over. If being by yourself aint your thing, there are monkeys for company. They are happy to be the uninvited guests, so keep the doors and windows closed if you ain’t around. The bedroom is replete with LCD Tv, heater, intercom, tea/coffee maker and wardrobe (with extra pillows and bed sheets). 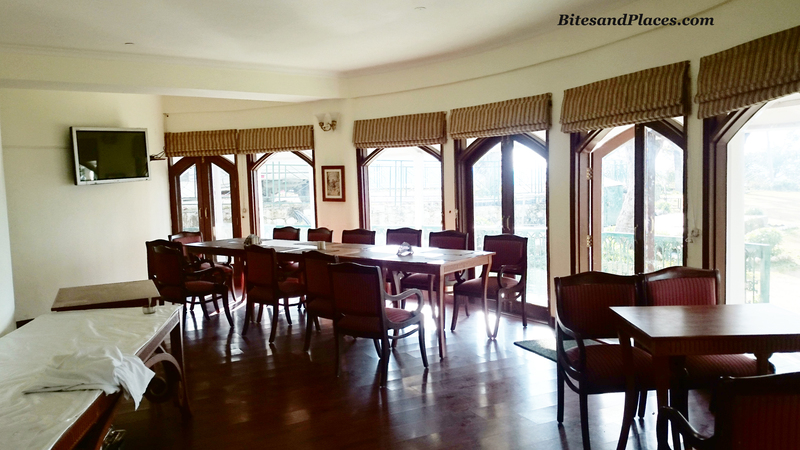 Dining – There’s a spacious dining room on the ground floor with great view of the garden. Mr. Bhagwat is an amazing chef and cooks delectable home-made food. While breakfast is included in the package, lunch and dinner cost Rs. 500 per person respectively. Staff needs to be informed in advance if you choose to dine in, as the ingredients are sourced freshly from the nearby market. 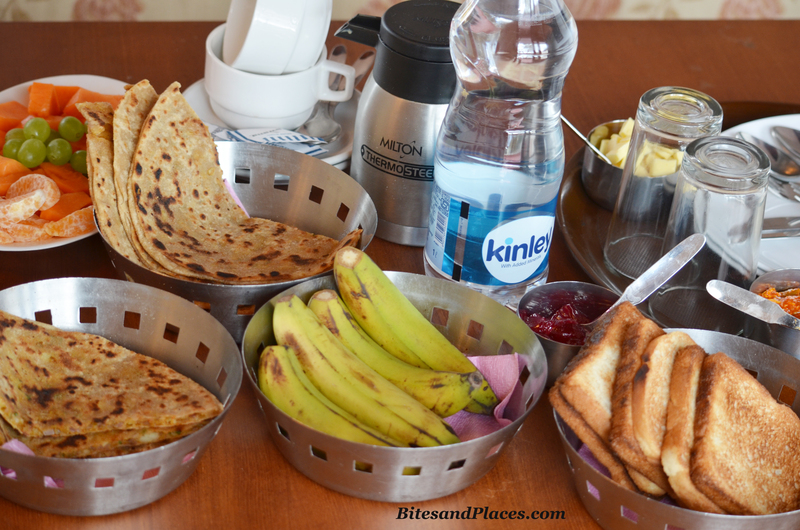 Breakfast is wholesome with yummy buttered Aalo Parathas, Omlettes, toasted bread, freshly cut fruits, tea and coffee. Steaming hot soup is brought to the room before dinner. Nice to keep you warm in that nippy, wintery evening outside. 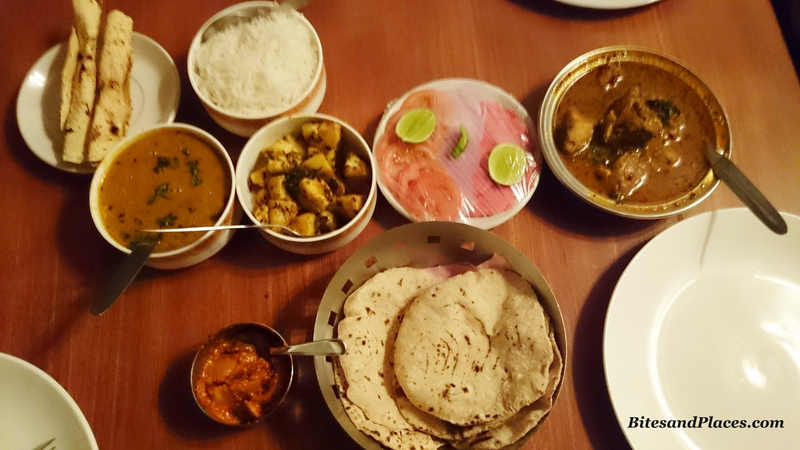 We absolutely devoured the Jeera Aalo, Chicken Curry and Mutton (Bhagwat’s signature dish and a highly recommended one too) for dinner in the warmth of our room. 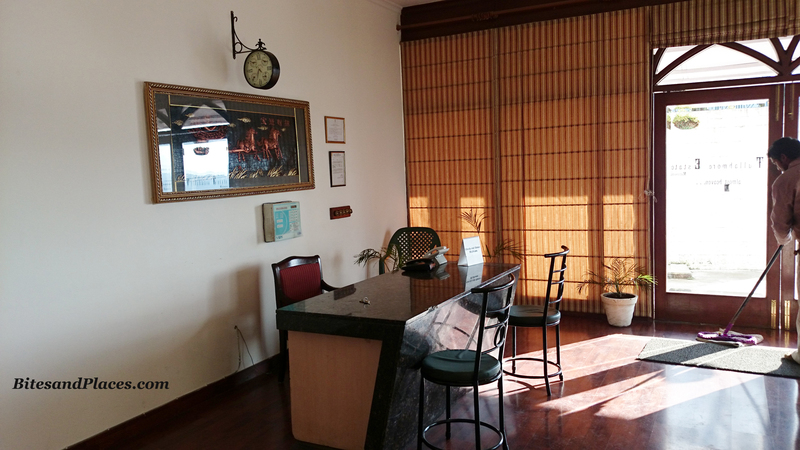 Amenities – The property offers ample parking space and free pick-up and drop to the Mall Road and Taxi stand. 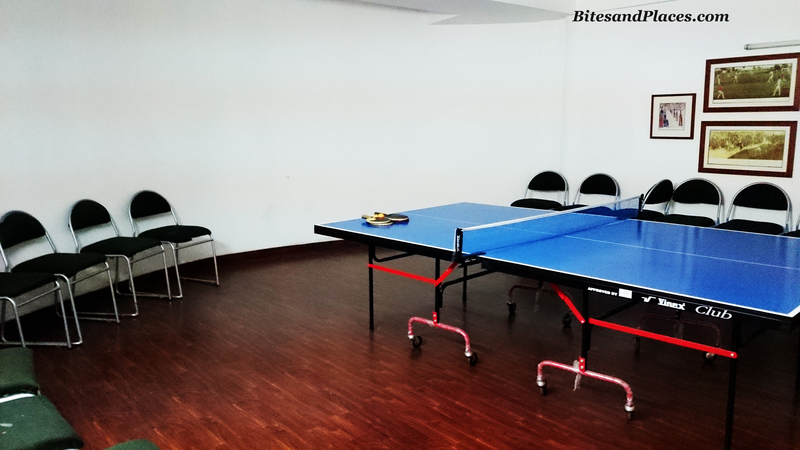 In-house activities include pool table, carrom, table tennis and badminton. Wanna lace up your adventurous shoes? There’s mountain biking on the menu. Else, just amble in the garden trying to grab that little warmth before the sun gets in the mood to play a peek-a-boo. 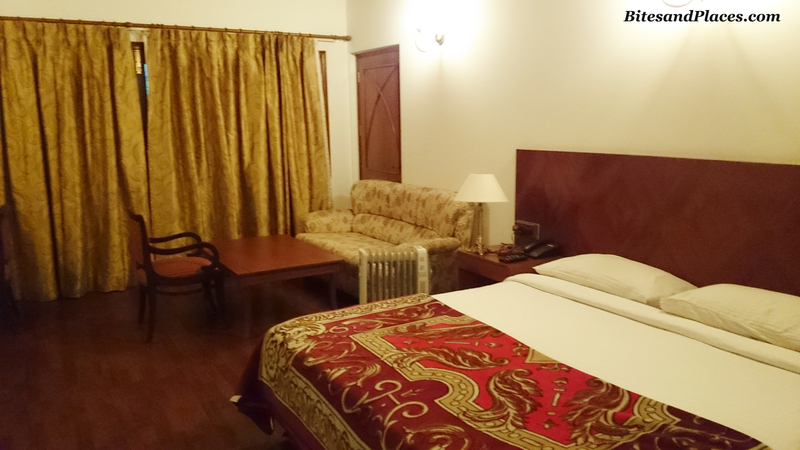 Service – There are around 4-5 people that run the entire show which is helmed by Mr. Rakesh Rawat, the Manager. He’s been of immense help right from the first call I’d made to him. He is pleasant, approachable and always kind to go out of his way to help. Everyone here is a multi-tasker. Bhagwat is a Chef, always smiling and also mans the reception in Rakesh’s absence. So does his kitchen-assistant. Its amazing how these guys share their duties. So whenever you dial a 9, there’s always someone to help you. Sanjay, the driver ferries you to and from the Mall Road at your beck and call. Knowing about my heart disorder, he went that extra mile to stay back late in the hotel in order to pick us up. These guys are truely gentle, generous and genuine! By Air: Jolly Grant Airport, Dehradun is 60 kms. Taxis ply regularly at a fixed rate of Rs. 1500. By Rail: Dehradun railway station is around 37 kms from here . Superfast trains like Mussoorie Express and Nandadevi Express reach you overnight from Delhi. There’s a taxi stand just outside the station. Rate is fixed at Rs. 700. By Bus: There are regular buses from Dehradun to Mussoorie and also from various metros and tourist places in Uttarakhand and also from outside the state. Looks like an awesome property. Reblogged this on Anything Interesting on WordPress. I stayed here some four Years ago in 2011..and This Year again Planning a small Visit. The Best thing I loved about your post is that how well you remember ‘the people’ who make your stay a pleasant one. In my case its going to be my First meeting with Rakesh ji, tho I have spoken to him twice about the Wrong Location Marker of this awesome place on the Google Maps. I edited the place-markers last week and they shall have the New location online soon. During my visit it was Ashu Bhaiya’s SUV which used to ferry us up and down and It was Surender Kumar ( who is NOW in SAVOY -KARNAL) who was looking after the Place. Your Description of this place …touched ‘mine’ .. Thank you so very much, Jeasbe, for your kind words. True, I try to remember all those people who make my stay memorable in whichever place I go. Coz I feel it’s the relations I bring back home along with the experience. Also, I always wish that whoever reads my posts, if they ever happen to visit that place, they ask for that person. Imagine how happy he’ll be to know that his clients already know him even before they’ve even seen him, that there’s a mention of him somewhere on the internet. You too have a wonderful mind to go out of your way and change their location on Google Maps. I’m sure it must have made them a lot of difference.